The Mayo Mountain Rescue Team work alongside and in conjunction with many different agencies, when the team is operational on a call out. 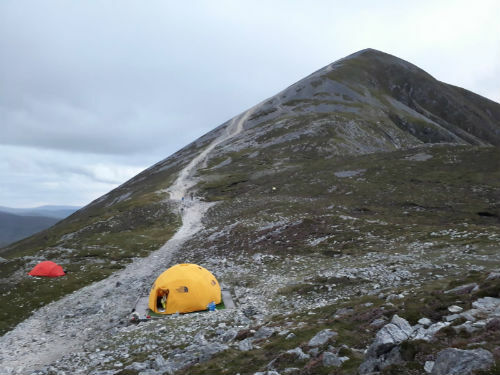 The Mayo team are also on hand to assist other Mountain Rescue Teams in Ireland should they need assistance for larger complex search operations. Mayo Mountain Rescue Team have a close relationship with all the Mountain Rescue Teams throughout Ireland under the umbrella of Mountain Rescue Ireland Insert MRI logo, as we pull their resources, personnel, expertise and equipment for assistance from time to time on particularly large operations. On the last Sunday of July every year, Mayo MRT pull every MRT team to Mayo to assist in the biggest Mountain Rescue Operation in Ireland, if not Europe. The Reek Sunday Climb (Garland Sunday), where up to 30,000 people, in the past, summit Crough Patrick in a 24 hour period. All eleven teams from Ireland and Irish Cave Rescue Organisation assist and Mayo MRT have also welcomed teams from further afield such as Calder Valley in the north of England, teams from Austria and Switzerland. 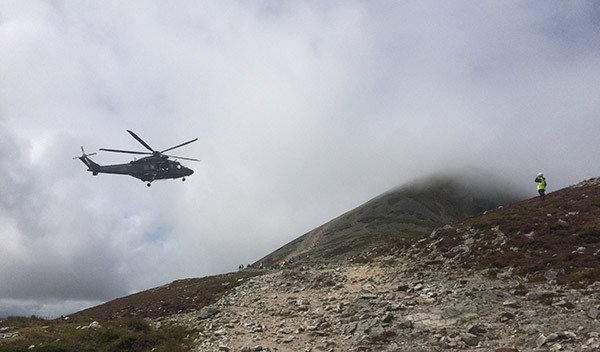 The tasking agency for mountain rescue in Ireland is An Garda Síochána (Irish Police Force). When a person dials 112 or 999 and requests help from mountain rescue, their call is routed through the local Garda command and control centre and the Gardaí will then notify the appropriate MR team that covers the area to respond. The Gardaí will work in conjunction with the team to supply logistical support and if required Garda personnel on the ground to assist with the running of the operation. The local Gardaí will appoint a member to liaise with the MR rescue base coordinators. When someone finds themselves injured in the mountains, the first port of call medically, will possibly be with one of their companions, who might have completed a first aid course (Mountain Rescue encourages anybody who is venturing into our hills and mountains to have a completed a first aid course). When members of the MR team arrive they are part of a chain in the continual delivery of pre-hospital care. When MR gets you down off the mountain we then deliver you into the expert hands of the local ambulance service to continue your journey to definitive medical care. The Mayo Mountain Rescue work closely with the local Order of Malta ambulance service and the HSE Ambulance Service. MR teams work closely with members of the Irish Coast Guard. For ourselves, we have a good working relationship with our colleagues in the Sligo based Rescue 117. They have assisted us on many difficult operations with personnel drops, equipment drops and casualty evacuation. On a number of occasions each year the Coast Guard travel to Mayo to train the Mayo team with operations involving the Helicopter and safe work around it. As part of the remit of the Irish Coast Guard, they provide an all weather search and rescue helicopter service. There are four bases in Ireland, these are located at Waterford, Shannon, Dublin Airport and the helicopter SAR base that we work closest with is the crew of the Sikorsky S-61N helicopter based at Sligo Airport call-sign Rescue 117. In prearranged and prolonged operations the Irish Air Corps provides support to MR with its air assets. Between its Agusta Westland AW139 and it Eurocopter EC135 they can provide aerial support in searches, personnel, equipment transportation into the mountains and casualty evacuation. The Air Corps have also been very beneficial to us, in transporting equipment, personnel and supplies onto Crough Patrick in the days coming up to and on the famous day for the pilgrim climb. In prolonged searches the civil defence provides use of their resources to assist with the operation. The civil defence play a major supporting role to the team with trained search managers, trained searchers and transport logistics. The Civil defence are also a major asset to us during Reek Sunday where they provide extra personnel for base operations, and also provide a rescue team on the hill. MMRT is also assisted in search operations by the Search and Rescue Dog Association (SARDA) when required. This involves a dog handler and search dog from SARDA attending our callouts when tasked to do so by the Incident Commander.